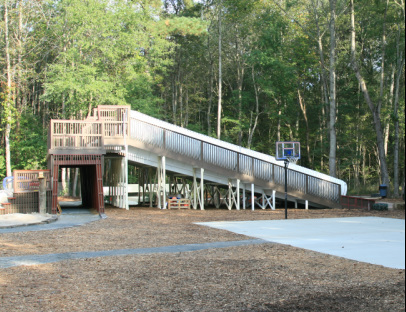 The Slides have proven themselves to be the most popular attraction at Go Play Outside Now, LLC. Something about going down a 45 foot closed tube slide at a 35 degree angle makes you feel like a child again. In the spring and fall they become a dry slide, where our guests use a burlap bag or a piece of carpet and slide down, trying to break their best friend's record. The slide that is on the right in the picture will always remain a dry slide. In the winter we power up our snow-maker machine and use one of the ramps for sledding - along with part of the beach area. We love bringing snow to our neighborhood and the triangle when the weather allows us to do so every winter. Then during the summer we turn on the water jets and the slide closest to the basketball courts becomes The Wetslide. Guests do go significantly faster down The Wetslide rather than the dry slide, so we ask for our guests cooperation each day that we have The Wetslide open. 1. Guest must sit down on their bottom and face forward. They should not go down the slide on their stomachs, backs, knees, etc. They should also not be facing any other direction other than forward. 2. If you wish to ride down with another guest, please ride down with them. A guest should not go down the slide while another guest is still in the slide - which would cause unnecessary injury. 1. We will have lifeguards or attendees on duty to ensure that no one in injured. We ask for your cooperation. 2. Please don't send more than one guest down the slide at once. 3. Please wear proper attire (t-shirts and shorts). Since swimwear isn't allowed inside Park grounds, we can't allow it on The Wetslide. You can however wear it under your clothes but you should keep your clothes on for the duration of your visit at Go Play Outside Now.